These days, I’m reaching for Sandalo (1989). I admire its dry, well-bred aspect: Mysore sandalwood, myrrh gum, amber and some subtle florals lurking in the background. It has greater tenacity than Floris’ classic sandalwood scent and, owing to the myrrh gum, a touch more of the exotic. Picking up the bottle is like discovering some careworn old accessory that works perfectly with today’s look. 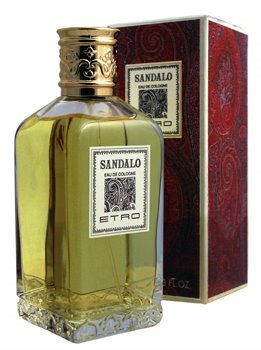 A great daytime scent, Sandalo can be worn easily after a shower or with a loose-fitting weekend shirt. Or with nothing at all. I agree with you that the bottles are perfection: elegance without ostentatiousness! And since they came with the vampiric Messe, who can say anything bad about them? Not me, in any case. E., I look forward to reviewing more of the Etro scents, especially Shaal Nur which my boyfriend recently introduced me to, Heliotrope and Dianthus. I really can't think of a single ETRO I wouldn't want to own. Even Anice, which isn't really my kind of scent, but there are always those days when it catches the mood. Mahogany, Magot, and New Tradition are the ETROS Ive had my eye on lately. Vicolo Fiori is a love of mine for a LOONG time, will never be without it. Glad you like Shaal Nur - its very special.